Product #21738 | SKU BEX18 | 0.0 (no ratings yet) Thanks for your rating! The Behringer X18 - Compact 18-Input Digital iPad/Tablet Mixer is designed for live sound reinforcement and recording applications. 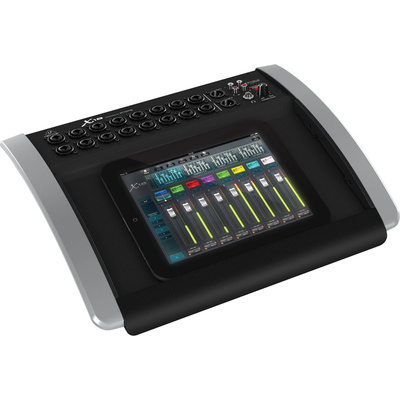 The device is designed to sit flat on a surface and features 16 top-facing MIDAS-designed fully programmable microphone preamps via balanced combination Line Level TRS and Microphone XLR-3F connectors, an integrated Wi-Fi module for wireless control from an iPad or tablet, and an 18 x 18 channel bi-directional USB audio interface. The mixer can be controlled via a free iOS or PC application when connected to an Ethernet, LAN, or Wi-Fi network. Controlling the mixer using a portable device allows you to reference your mix from different listening positions within the venue or studio. The free control app includes four stereo (eight mono) multi-effect processors including delay, chorus, dynamics, 31-band EQ, and simulations of classic analog equipment such as the Lexicon 480L and PCM 80, EMT 250, and Quantec QRS reverbs. The application also includes a 100-band Real Time Analyzer (RTA) for every channel and bus EQ. The mixer is also capable of sending up to 16 digital sources over CAT5e cable to ULTRANET-compatible devices such as Behringer's P16-M personal monitor mixer for musicians as well as Turbosound iQ loudspeakers for PA applications. Additional I/O include two XLR main outputs, six TRS outputs for auxiliary bus sends, MIDI In, MIDI Out, stereo RCA inputs, stereo RCA outputs, and a headphone output with dedicated level control. You can record your mix via the 18 x 18 USB interface using your digital audio workstation (DAW) of choice. The mixer comes with a copy of Tracktion 4 Audio Production software which provides unlimited track counts, MIDI recording and automation of track dynamics, and support for VST and AU plug-ins.